I just really needed a wash. It had been several days since I’d felt warm soapy water running over my skin. There had been a handful of bus trips in the humidity of southern Thailand, a scuba diving course spent immersed in tropical waters, after which I had (wrongly) considered myself completely cleansed. Then there was the night spent celebrating my newfound PADI qualification in the streets of Krabi followed by a windswept ferry ride over the sea border into Malaysia. 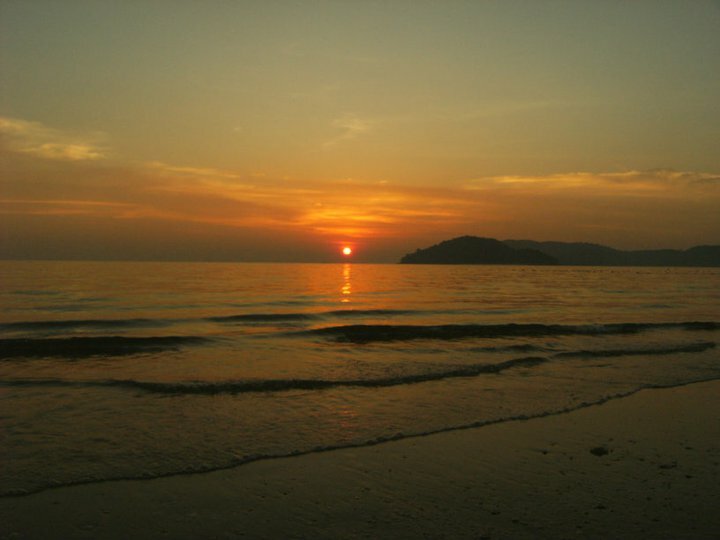 We found ourselves on the paradise island of Langkawi, famed for its cable car ride to the island’s mountainous centre and palm-laced beaches offering sunsets worthy of a Hollywood movie. In contrast to our beautiful surroundings we were dirty and tired. Exploring would have to wait until the morning. As would a shower, it seemed. Opening the door to our beach shack’s bathroom unveiled a lonely toilet, with only a short cut of green hosepipe protruding from the ground in place of a tap. A sea-bath was beginning to look appealing. The next morning the mountains beckoned and we hired a moped to get us there. It was my virgin drive of any such contraption, but the hire shop didn’t seem too bothered. They showed me the ignition, acceleration and away we wobbled with a nervous wave and a shaky smile (I hadn’t accounted for the unbalancing affect of a passenger, but we had helmets at least) Chuckling to ourselves that this would never happen in the UK without tests, forms and a serious set of signatures, we wound our way slowly, cautiously and not at all coolly inland towards the hills, a cable car ride and Seven Wells waterfall where we could finally revel in a long-awaited wash. Stopping regularly, mostly to sip water and calm my nerves with mini-pep talks and arm-swinging exercises, the small harbours, jetties and strings of picturesque cafes we discovered were eerily empty. Only the sound of small boats smacking the water as they rocked slightly in the breeze resonated. The silence didn’t last however, and as we approached the cable car center, herds of bum-bagged tourists sloped into the gates of the park. Kids squealed, mothers shouted and fathers reluctantly bought tickets to ‘the top’. We joined them, suddenly feeling quite the trendsetters with our motorbike helmets under our arms. The ‘top’ didn’t disappoint. As far as elevated jungle walkways go – I had limited experience of any others – it was pretty spectacular. 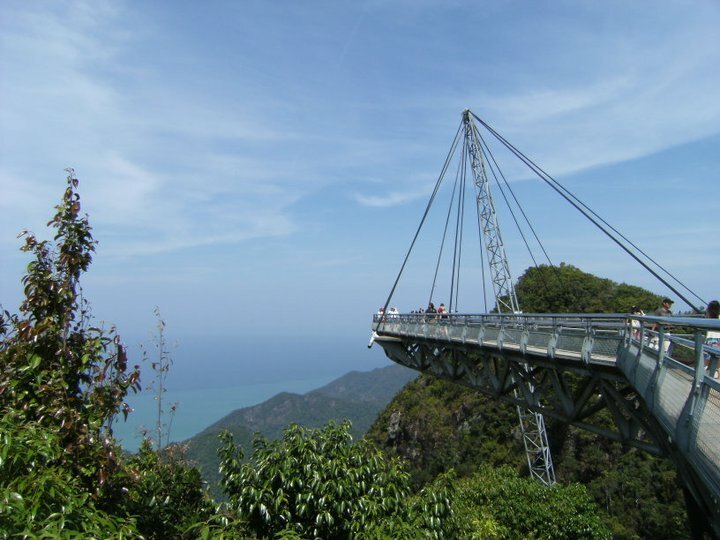 With wide steel bridges connecting several precipices that offered near-360-degree views of the island. We spotted the inlets that had littered our route, and despite the heat haze, could even make out ships’ silhouettes on the ocean horizon that surrounded us. The obligatory snaps were taken, information placards read and overpriced drinks bought at the café perched at the highest pinnacle, but our fellow tourists were suffocating, and we were well overdue a wash. In the heat of the day, the final stint of our moped tour was a sweltering one, and we were ecstatic to undertake the final leg of the journey on foot under the dappled shade of tertiary rainforest. The turn of a corner brought us into a clearing where the deafening thrash of rushing water was quickly overtaken by the view of the fall itself. Sliding dramatically off glistening rocks over 40 feet above us and plunging into a bright green pool of crystal clear water, it was the best shower I had ever seen. Stripping into bikinis we slipped in, allowing ourselves to be fully immersed in the refreshing liquid. The world above edged away from me as my head went under, the sounds of the fall, the birds and nearby animals drowned to a faint hum by the water around me. When I popped back up and regained my senses, I quickly realised we weren’t alone. Not another tourist in sight this time, but instead, an unexpected visit by the locals. 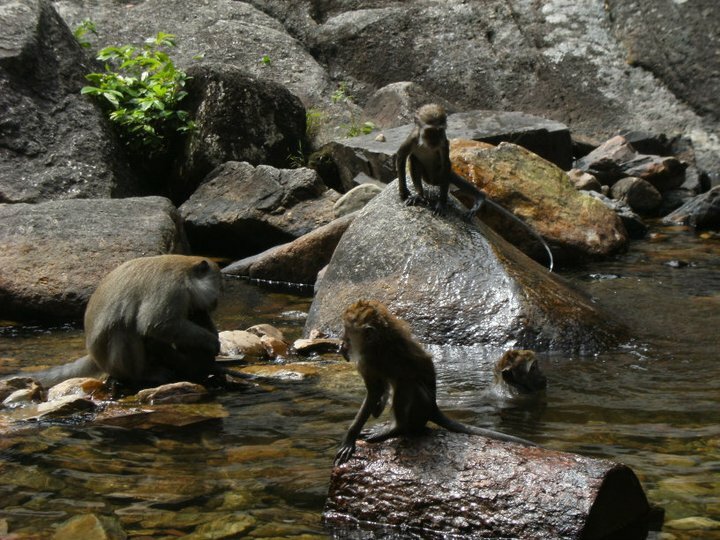 Accompanied by whoops and hollers, a troop of monkeys had asserted themselves on neighbouring rocks as we were bathing. It was clear whose territory this was, so quickly and silently we hoisted ourselves onto the bank and diligently grabbed our cameras. One by one, our new friends gingerly lowered themselves into the pool as we had done only minutes before. Chattering to each other intermittently while treading water and performing what appeared to be a more efficient breaststroke than my own, they enjoyed their own wash. Aware of us, but not in the least perturbed, they went about their business, before settling on the sunbaked banks to dry off and examine each other for any unseemly lodgers. I felt like the intrepid Attenborough; a privileged witness to one of nature’s happiest moments. As so often happens while travelling, a mission to fulfill a basic need had resulted in an event far removed from normality. With our dirty brown toes, shaggy hair and bathing habits, we were very much like the monkeys. 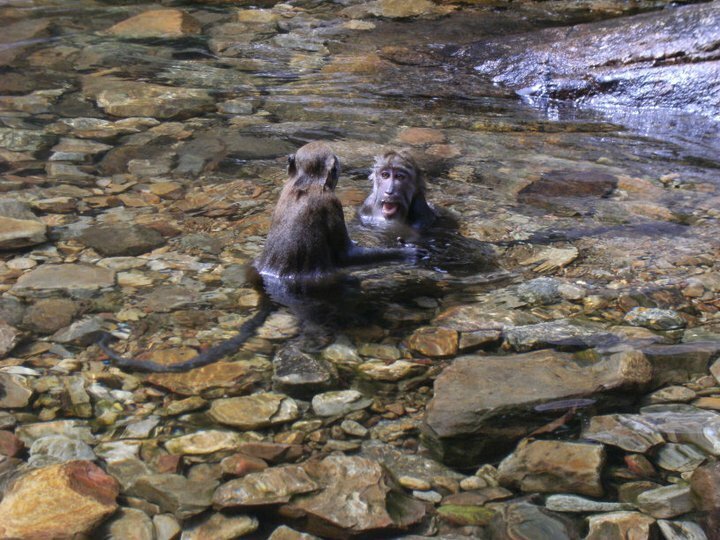 With their swimming strokes, socialising and grooming rituals they were almost human. The lines were well and truly blurred. As evening fell, I returned the moped and realised for the first time that I was grubby again. Flies had died in my suntan lotion, sweat had dried on my shirt and moped oil glazed my calves. It didn’t seem to matter now. We sat wearily on the sand by our shack and gazed into the distance as an orange fireball dropped slowly out of the sky, into the glassy ocean in front of us. So we were still absolutely filthy, who cares?